I love any kind of veggie burger. I find they tend to have a much fresher taste, and are often filled with rich, spicy, flavours. 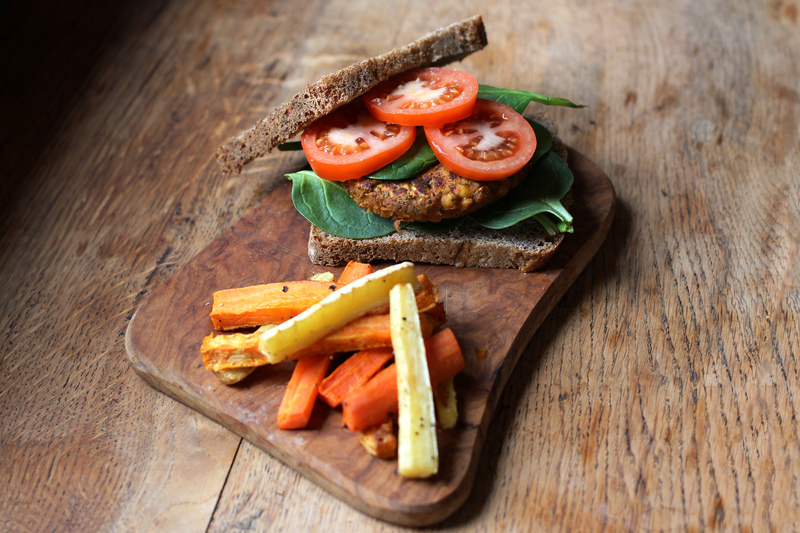 Vegetables or legumes are perfect for burgers, and make a great way to sneak some of them into your diet if you aren’t usually a fan of their taste. Chickpeas are my favourite type of legume as they’re so versatile and have a great texture. Whether you’re making them into a hummus, stirring them into a curry or sneaking them into a cake, there’s almost nothing to dislike. 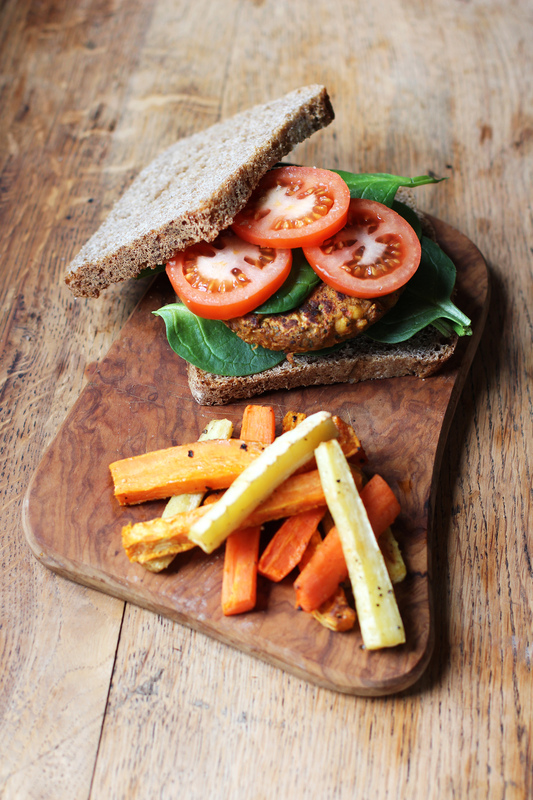 With this recipe, I used the chickpeas to make them into burgers. 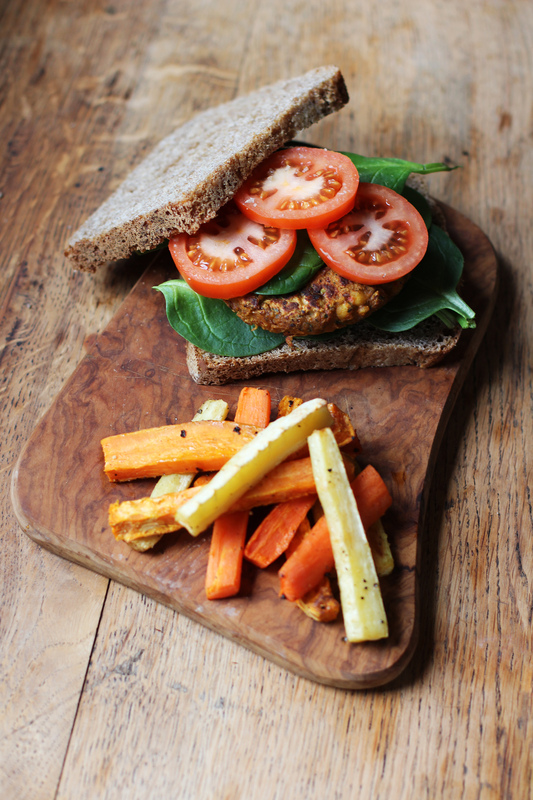 I’ve always loved chickpea burgers, so knew I had to make my own recipe for one. I created this recipe as one of my first when I started blogging on an old site. It was only the other day that I thought about this recipe again, and felt inspired to improve on it and make it to share on here. After just a few alterations, I can safely say that I now have a new favourite burger recipe. This is something I love to eat, and I can’t wait to make time and time again. 1. Firstly, combine the flaxseeds and water into a bowl and set aside to form a gel. 2. Then, finely slice your onion, and roughly chop your red pepper into small cubes. Add the onion into a pan on a high heat with the sunflower oil, cumin seeds, coriander seeds and cardamom pods. Fry for 3-5 minutes, until golden. 3. Then, add in your red pepper, ground ginger, chilli, ground cumin, ground coriander, garlic puree, tomato puree and lemon juice. Fry for a further 3-5 minutes until soft. Then, set aside briefly to cool down. When this is done, add the mixture into a blender, and blend into a smooth paste. 4. Next, transfer the paste into a food processor, and add in the chickpeas, spinach, flaxseed mixture and a pinch of salt. Blend briefly until fairly smooth, but still has the odd piece/whole chickpea in it. Then, add in the chickpea flour, and stir together until evenly mixed. 5. Now, divide the mixture into 6 evenly sized sections. Place a pan on a high heat and drizzle with some oil. Press 1/6 of the mixture into a burger shape, and place onto the pan. Fry for 3-5 minutes on each side until golden and cooked through. Then repeat until all of your burgers have been made, and serve. I like to serve them with a salad and some of my root chips. Enjoy! Oh these look delicious! I love a good veggie burger!